We've been using our new Samsung Chromebook for about a month now and it has become our favourite road device and preferred "Let Me Google That" tool. With an 8 second cold boot time, over 6 hours of battery life, and secure access for employees and guests, it's the perfect business and personal cloud productivity device. Today, Chromebooks have been enhanced for simple public kiosk use. For more details visit: Chromebook kiosks for customers and employees. Public users leave no trace behind and IT managers have no viruses or malware to worry about. Starting at a price of $249.99 (on sale for $229.99 until May 2!) at Best Buy or Future Shop, it's a very cost effective business or family computing solution. A Google Apps domain is not required to use them but certainly having one gives you enhanced administration and control over the devices deployed across your organization. For example, you can centrally configure the passwords for WiFi hot-spots your employees may access. For more details, take a look at Google's documentation on Managing Chrome Devices. In Canada, Alberta School boards are fans and have deployed over 3,400 Chromebooks so far. Our customers that have already eliminated servers from their premises and moved to the cloud are ready to go! 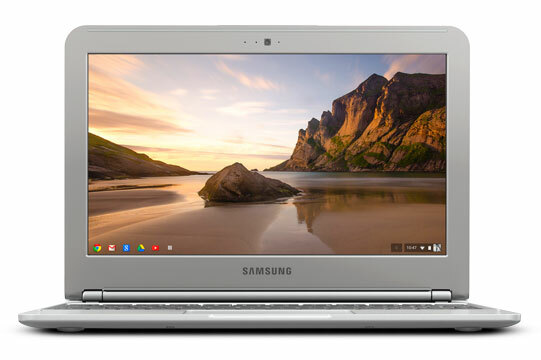 The cost savings of Chromebooks add up quickly when you consider the alternative of buying a Windows netbook, Microsoft Office, antivirus, and a Windows Server (domain controller) to centrally manage passwords and computer policies. Yet on Windows devices, you are still at risk unless you encrypt the hard drive. Windows with Microsoft Office or Outlook store oodles of confidential email and other documents on your notebook hard drive that is easy to access if it falls into the wrong hands. With a Chromebook, you can still store email and documents offline for updating while on a plane but it's stored in an encrypted format and the built in secure boot features ensure that your data stays secure. Plus, it is easy for administrators to remotely wipe a Chromebook, leaving no trace of the data that was on the machine. Contact us at InterlockIT.com to learn more and to determine if Chromebooks are a good fit for your organization!